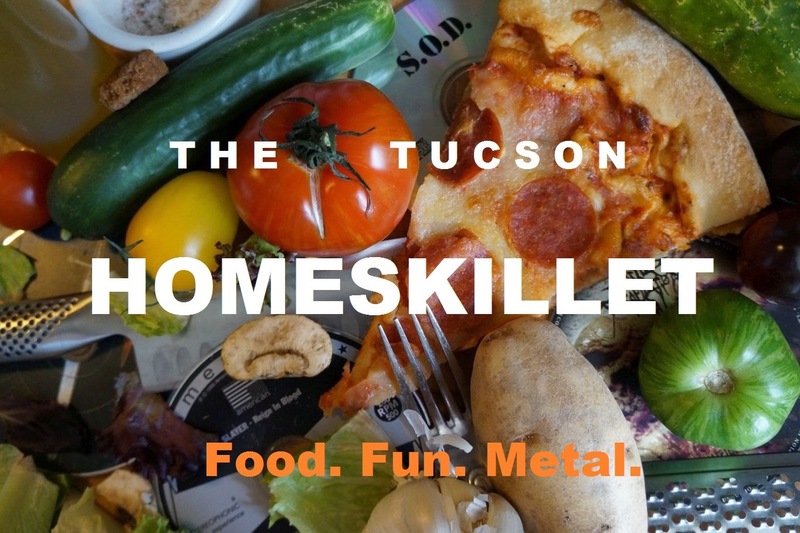 The Tucson Homeskillet: Wait...Italian Food That's Good, Fast AND Affordable? Let's Do This! Wait...Italian Food That's Good, Fast AND Affordable? Let's Do This! Falafel King struggled in that location on Campbell and Ft. Lowell for a time, only to close its doors in early 2016. Falafel King was good, it had its moments, but the fact that the site is situated next to one of the better taquerias in town, a bustling sandwich shop, a Mexican food staple and an Asian restaurant that continues to impress and persist, it became quite apparent that the fare they were dishing out just couldn't manage with the nearby food competition. We weren't devastated when Falafel King left, there are far greater Mediterranean spots in the immediate vicinity, but for a quick shawarma at a good price it was one of the better options in the neighborhood. A few months later the marquee came down only to be replaced with a bigger and brighter one. The name was different and the concept seemed to be a complete 180 from the previous occupant. It read: Orenccio's Ristorante Terrazza...Express! Wait. The slightly upscale Italian restaurant on River and Campbell and the o.g. place in Nogales is opening up an "express" spot in midtown Tucson? For realzies? The restaurant row of Campbell Avenue is wrought with all kinds of badass eateries, most of which feature Italian inspired food. Sauce is right down the street, next to that is Old Chicago and down a ways is Pionic, all of which dish out quick and tasty sandwiches, pizzas and pastas for not a lot of dough. So where will Orenncio's fit in? Or will it? Either way, we were excited to see what they had to offer and see if the "express" food could hold up to their sit down, $20 a plate (to start) Italian dishes. Thing is....we would have to wait a bit to get there. The sign was up, the internet was slightly a-buzz with information and anticipation of the new location and I even sent them a message via social media asking when they are going to open. "We actually open this Thursday," was the response. "We hope to see you there!" Newspaper still covered the windows, for another two months or so. But, eventually, the windows were clear, the "OPEN" sign was on and the doors were unlocked and ready to welcome customers. That's when the Tucson Homeskillet crew stepped in and ordered up. It's a relatively small space, reminiscent of the old Falafel King layout; plain but functional. 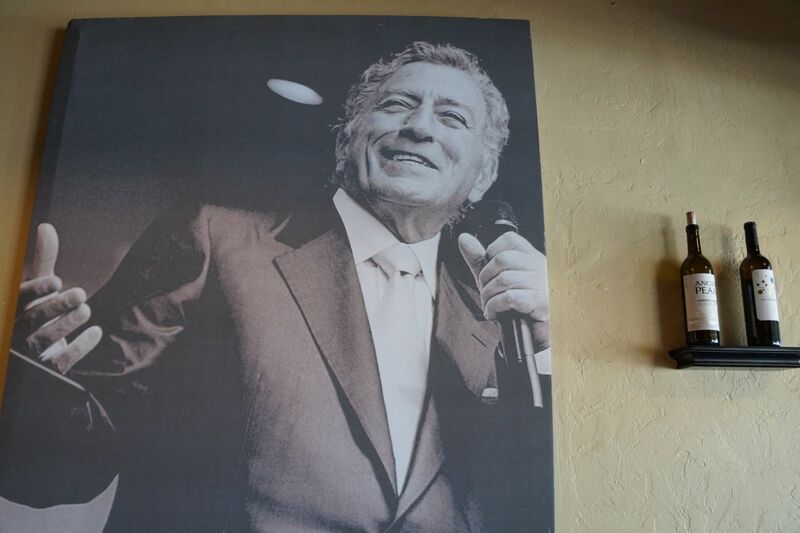 There were some tables inside and out on the patio, classic Italian music played lightly over the house system and two guys behind the counter greeted us as we entered. A long menu is stretched out over the ordering area with items similar to the other restaurants but at a fraction of the cost. With an fairly decent yet paired down menu, we decided to start off with a couple of appetizers. Orenccio's Express meat and cheese board, the Tabla de Quesos, was only $9 and it had an impressive selection of thinly sliced prosciutto and salami, well thought out cheese varieties to accompany the cured meat, fresh crackers and seasonal fruit to round it off. For nine dollars. And it wasn't skimpy. Oh no. And it was really good. You kiddin' me? A charcuterie board for less than ten bucks? So far we were beginning to like this place. 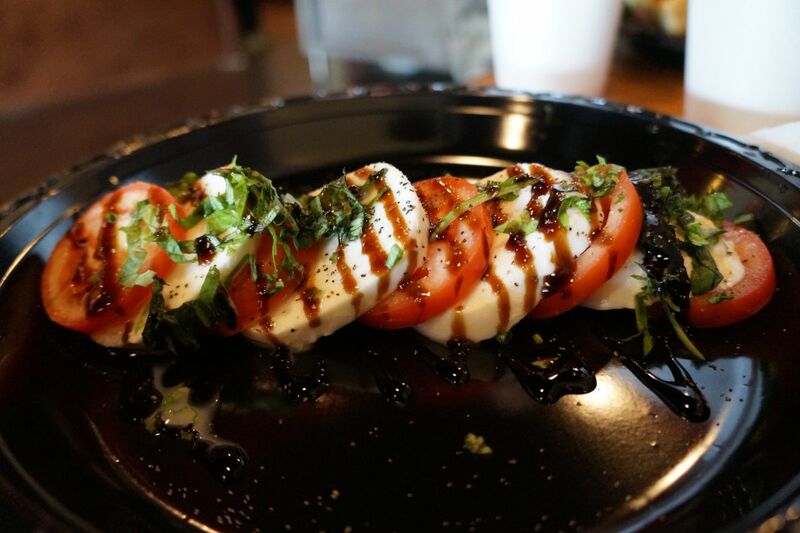 Next up we tried out the Insalata Caprese, you know, the caprese salad. Again for $7 we were treated to a hearty line of summer ripe tomatoes, house made mozzarella, a bright chiffonade of basil and then drizzled with a balsamic glaze dressing that was tart and acidic without being overpowering. All of the elements came together nicely and this just made us excited for our other entrees that were coming up. Two tasty and generous appetizers for less than $20...in a Italian joint? 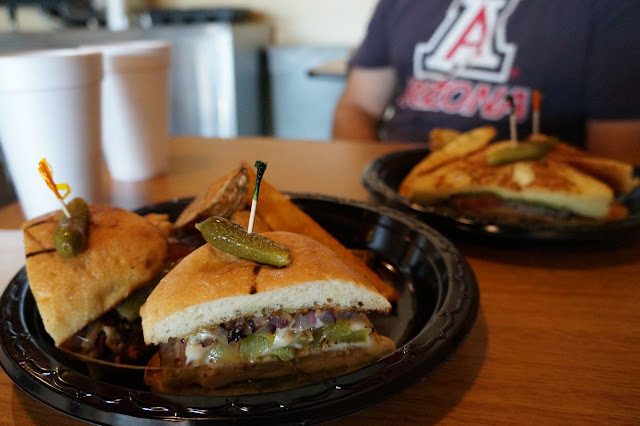 Orenccio's Express has six different styles of panini sandwiches and we ended up, initially, getting two to try out. 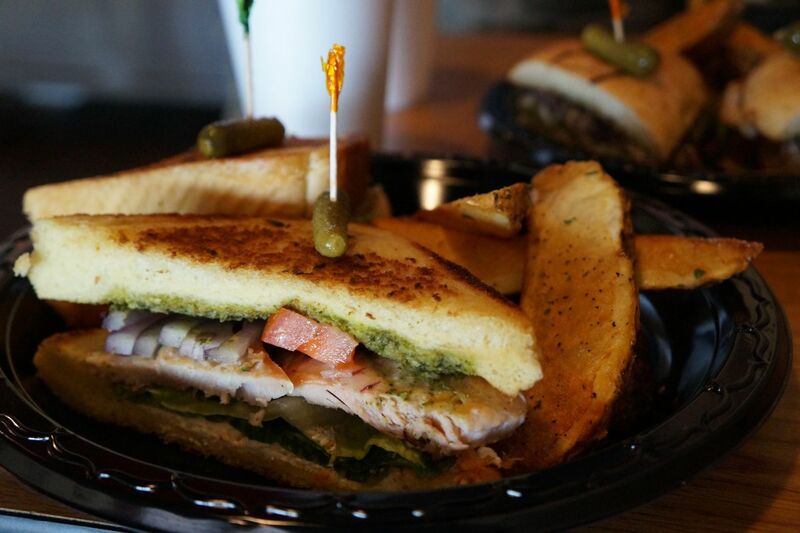 The "Rat Pack" sandwich promises both smoked and grilled salmon, with cream cheese and pesto. This panini was good but not the best salmon and cream cheese combo we have had. All the flavors came together but, not too sure, it needs a bit of work. The salmon was a bit fishy and even with the cream cheese and pesto it felt a bit dry. Hopefully they will read this and fix it but overall, for $7, and served with chunky and well seasoned steak fries (which are kind of my favorite), it was a nice lunchtime treat. The other one we sampled was the D Pollo Panini...you know, chicken panini. This one was made with grilled onions, basil, mayo and a dash of red pepper flakes. Redemption came with this sandwich because we really enjoyed the flavor fusions here, even if they were a bit elementary. Perfectly cooked and seasoned chicken, the mayo added a nice decadent viscosity and the basil and red pepper made for a slightly spicy and verdant bite each time. This made us hungry and curious for the other paninis which include a "Dean Martin Burger", a fish fillet panini and a veggie option. All served with fresh and crunchy lettuce, tomato and onions, the paninis, so far, were tasty, and we are sure that with a little time, focus and getting that grill a work out and seasoned, this could be the next midtown hot spot for a quick and delicious lunch or dinner. Finally we gave some of their pasta dishes a spin around the block. 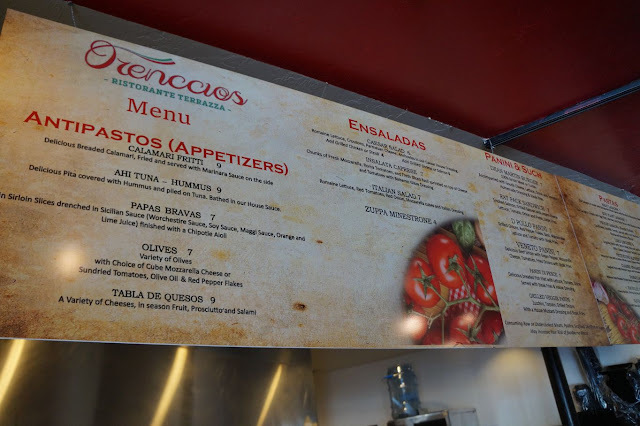 Orenccio's Express has nine different options here, all of which are under $10. That's, like, totally unheard of in most Italian restaurants. Heck, you can barely escape a mid ranged Italian joint without shelling out 12 bucks for angel hair in red sauce. Here though, you wont go broke getting your succulent carb fix in. 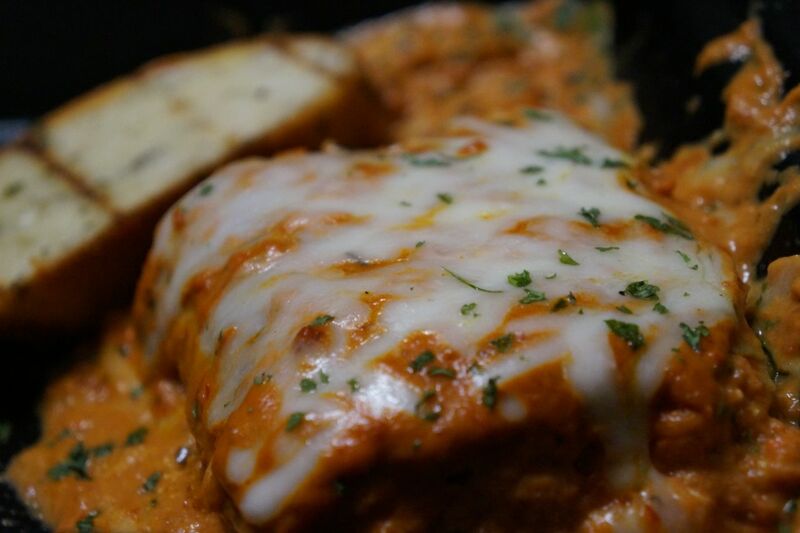 We ordered the "Nona Esther" or the veggie lasagna, which lists cauliflower, zucchini, carrots and spinach as their features all surrounded with a deep marinara sauce and topped with mozzarella and ricotta cheeses. To say the amount and style cuts of the vegetables were ample and rustic is putting it mildly. They don't kid around with the cauliflower and zucchini and the carrots were thick and bold along with a good dose of spinach to round it out. With the sauce and cheese this was one of the better veggie lasagnas we have had for this price and you wont leave hungry after eating it. One problem though: We got two, two big unremoved bay leaves in some bites and that threw us off a tad. Not only were the leaves full sized but they were pretty stiff so we could have sliced our tongue if we weren't careful. This is all in the learning process though, seeing as this concept just opened its doors, although leaving bay leaves in a dish like that is a bit of an oversight. Still, the veggie lasagna was a delight and we hope in the future they will be a bit more careful with their preparation of this dish. 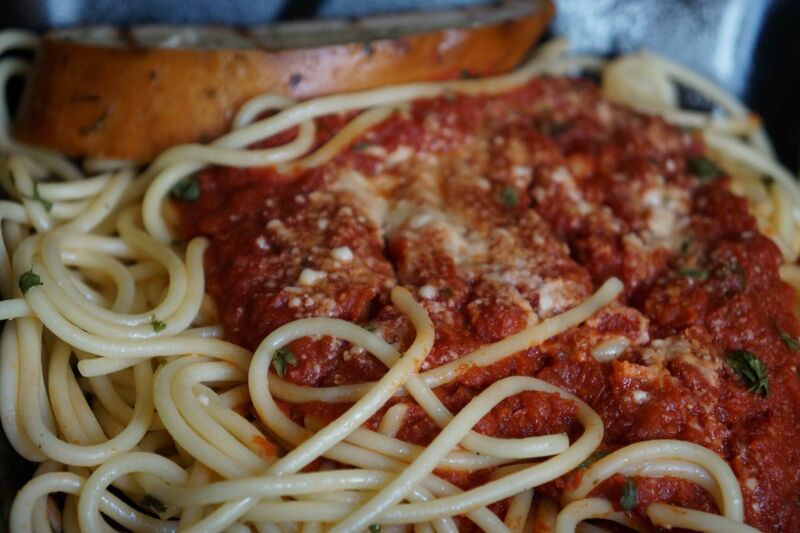 Finally we tried out the classic spaghetti marinara. Because, think about it, if they screw this item up they should rethink their business plan, quickly. An Italian restaurant getting a basic spaghetti marinara wrong? No way. 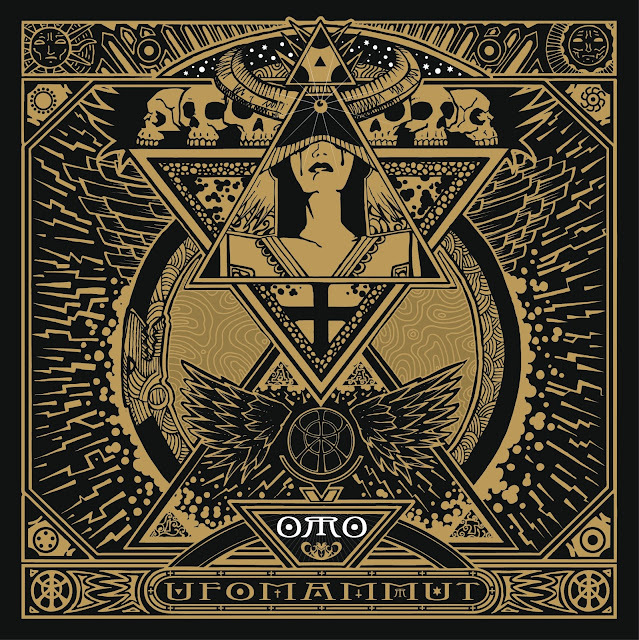 It's like eating a bad club sandwich in a funky diner or a crappy taco in a Mexican joint. If you can't do the essentials then it's time to pack it up and start selling insurance or something. Luckily, this dish was great. Simple, slightly perfect and very satisfying. The sauce had a good sweetness to it, which we liked, and the pasta was al dente and was a perfect cling for the robust marinara. Topped with some good parmesan cheese and basil flakes, there really isn't more to say than, yeah, for $7 you are treated to a nice Italian comfort food staple and for that we were thankful that they got it right. 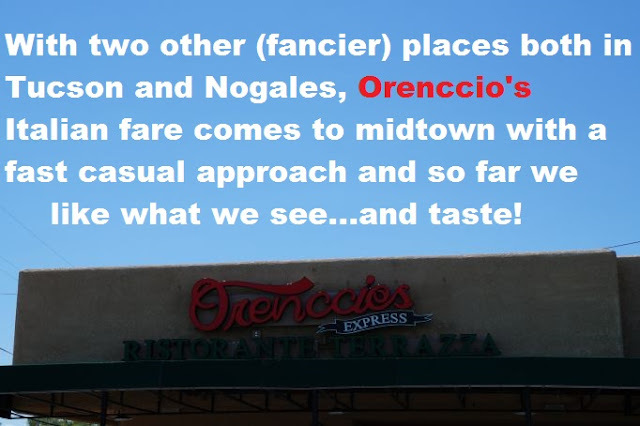 Orenccio's Express is still new, still developing but we can see them becoming a lunchtime go to and dinner to go hot spot in the near future. Cheaper than most Italian fare in the district and better than at least one, Orenccio's does the other two original locations proper by giving the working folks in the central area with not a lot of time, or cash, on their hands a nice flavorful respite and a refreshing break from the usual greasy drek from nearby fast food establishments. We will definitely be back for more and are excited to try out all of the other dishes on the menu. I mean, we really want to dig into the Ahi tuna hummus and the beef bisteck panini looks and sounds amazing. Hopefully with a bit of practice and spice along with some wear in the kitchen this concept and location could really take off. Wait, they have a linguine with sirloin, broccoli and...teriyaki? Serious? Sorry, gotta go. Just reading that made us hungry.